392 Marlborough is located on the south side of Marlborough, between Hereford and Massachusetts Avenue, with 390 Marlborough to the east and 394 Marlborough to the west. 392 Marlborough was designed by architect Samuel D. Kelley and built in 1885-1886 by building contractor John W. Shapleigh, for speculative sale, one of three contiguous houses (390-392-394 Marlborough). 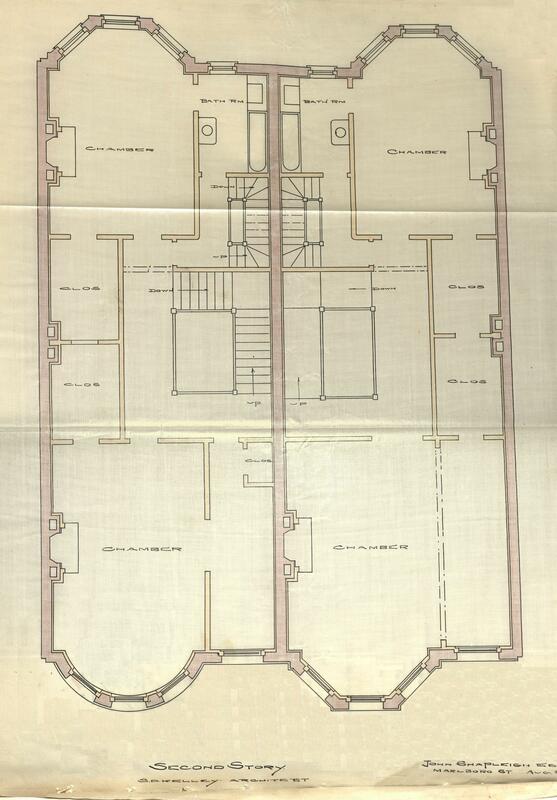 He is shown as the owner on the original building permit application for 392 Marlborough, dated September 3, 1885. John Shapleigh purchased the land for 390-392-394 Marlborough on June 24, 1885, from Benjamin Williams Crowninshield and Walter Channing Cabot. It was part of a parcel with a 498 foot frontage on Marlborough, extending west to Massachusetts Avenue, that they had acquired on January 20, 1880, from John Brooks Fenno and William Storer Eaton. J. Brooks Fenno and William Eaton had purchased the land that same day from Grenville T. W. Braman, Henry D. Hyde, and Henry M. Whitney, trustees of a real estate investment trust that had purchased several parcels of land on March 1, 1872, from the Boston Water Power Company. 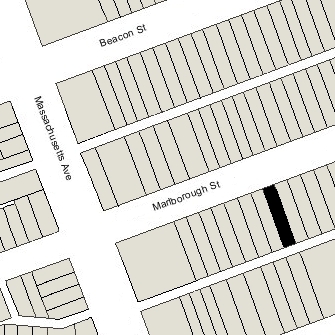 Click here for an index to the deeds for 392 Marlborough, and click here for further information on the land on the south side of Marlborough between Hereford and Massachusetts Avenue. On May 21, 1887, 392 Marlborough was purchased from John Shapleigh by Frances Otis (Wheeler) Benedict, the wife of wholesale wool merchant William Gardner Benedict. They previously had lived at 150 Huntington. Their sons, William Leonard Benedict, an investment banker, and George Wheeler Benedict, a wool merchant, lived with them. William Leonard Benedict married in April of 1891 to Maud Benson and they moved to Selkirk Road. George Wheeler Benedict married in October of 1891 to Anna Louise Bull. They initially lived with William and Frances Benedict at 392 Marlborough, but had moved to the Longwood district of Brookline by 1894. William Gardner Benedict died in March of 1904. Frances Benedict continued to live at 392 Marlborough. During the 1906-1907 and 1907-1908 winter seasons, William and Maud Benedict lived with her, and during the 1911-1912 season George and Anna Louise Benedict lived with her. Frances Benedict continued to live at 392 Marlborough until her death in March of 1920. Her son, George, had died in October of 1916, and in her will, she left the house to her surviving son, William, and to George Benedict’s three children: Margaret (Benedict) Gorham, the wife of Thomas Gorham; George Wheeler Benedict, Jr.; and Frances (Benedict) Baldwin, the wife of Robert Baldwin. 392 Marlborough was not listed in the 1921 Blue Book. On October 25, 1921, 392 Marlborough was purchased from Frances Benedict’s heirs by real estate dealer William J. Stober, and the next day it was acquired from him by Dr. Frederick Allen Marsden, a physician. He previously had lived in an apartment at 497 Beacon. He was unmarried. In November of 1921, Frederick Marsden applied for (and subsequently received) permission to remodel the interior and provide a second means of egress to the third and fourth floors. The permit application indicates the use as a three-family dwelling. In October of 1922, an egress report by the Building Department indicated the occupancy as being a doctor’s office on the first floor, one family on the second, and another family on the third floor. He continued to live and maintain his medical office there during the 1923-1924 winter season, but moved thereafter. On October 15, 1923, 392 Marlborough was acquired from Frederick Marsden by Wilda Mae Davis of Wakefield. On May 31, 1924, 392 Marlborough was acquired from Wilda Mae Davis by John Michael Grandfield, a teacher. He and his mother, Mrs. Jane (Jennie) (O’Dowd) Grandfield, the widow of Dr. Michael Grandfield, made it their home. They operated it as a lodging house. John Grandfield’s sister, Mary Christina Grandfield, also a teacher, lived with them. They previously had lived at 46 Sagamore in Dorchester. During the 1927-1928 winter season, John Grandfield’s brother, Dr. Robert Francis Grandfield, a physician, also lived with them. His wife, Agnes (Keough) Grandfield, may not have been living with him (only he is listed in the 1928 Blue Book); by 1929, they were living in Taunton, where he maintained his medical practice. On February 1, 1928, John Grandfield transferred the property into his mother’s name. Jennie Grandfield died in September of 1931. 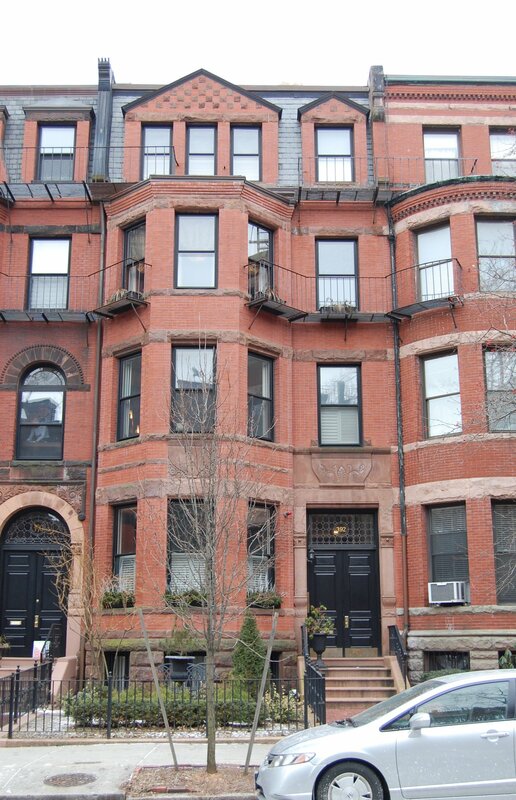 John Grandfield and Mary Grandfield continued to live at 392 Marlborough until about 1932, when they moved an apartment at 51 Massachusetts Avenue. 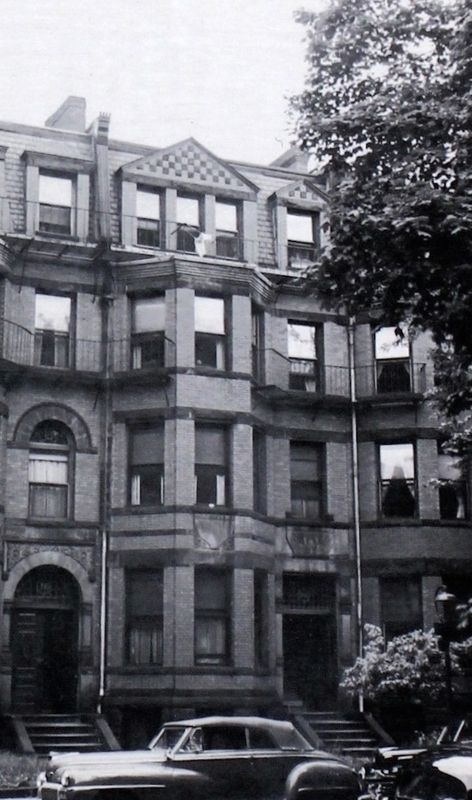 On December 24, 1932, the Massachusetts Hospital Life Insurance Company foreclosed on a mortgage it held on 392 Marlborough and took possession of the property. 392 Marlborough was shown as vacant in the 1932-1940 City Directories. On August 12, 1940, 392 Marlborough was purchased from Massachusetts Hospital Life by Miss Urbana Mabel Smith. She lived at 84 Bay State Road, where she operated a lodging house. 392 Marlborough became the home of Fred Hiram Williamson and his wife, Annie Beulah (Steeves) Price Williamson, who operated it as a lodging house. Annie Williamson was Urbana Smith’s maternal aunt (Urbana Smith was the daughter of Urbane Smith and Mabel Valencia (Steeves) Smith). The Williamsons previously had lived at 96 St. Botolph. After moving to 392 Marlborough, Fred Williamson continued to operate a lodging house at 107 St. Botolph. They separated in about 1942 and Annie Williamson continued to live at 392 Marlborough, and operate it as a lodging house, until about 1946. On February 19, 1946, 392 Marlborough was purchased from Urbana Smith by Rankin Smith Dickinson, a painter, and his wife, Mabel M. (Haynes) Dickinson. They continued to operate it as a lodging house. They previously had lived at 41 Rutland Square. Living with them were their unmarried daughter, Madalean E. Dickinson, and their son and daughter-in-law, William Rankin Allanson Dickinson and Dorothy Ray (Bodman) Dickinson. Rankin Dickinson died in November of 1953. Mabel Dickinson, Madalean Dickinson, and William and Dorothy Dickinson continued to live at 392 Marlborough. William Dickinson was an electrician. In May of 1964, Madalean Dickinson purchased and moved to 304 Marlborough, which she operated as a lodging house. Mabel Dickinson died in March of 1970. She left a one-half interest in 392 Marlborough to her son, William, and a one-half interest to her daughter and her daughter-in-law, Madalean and Dorothy Dickinson. William and Dorothy Dickinson continued to operate the property as a lodging house. On August 21, 1981, William Dickinson transferred his interest in the property to Dorothy Dickinson. He died in October of 1982. On February 6, 2003, 392 Marlborough was purchased from Dorothy Dickinson and Madalean Dickinson by the 392 Marlborough LLC (Gregory Cohen, manager). In March of 2003, Gregory Cohen filed for (and subsequently received) permission to convert the property from a lodging house into three apartments. On September 30, 2004, it converted the property into three condominium units, the 392 Marlborough Condominium.